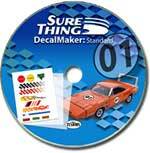 With Decal Maker: Standard Edition you can create and print your own custom decals! Decal Maker lets you import your own artwork and create custom decals, so you're never limited to the decals provided with a particular model kit. The built-in Text Effects tool lets you easily create eye-catching special text effects you can use in all of your decals. It works with any TrueType font installed on your system. You can also add drop shadows, change the outline and fill colors, create borders, etc. Choose from over 150 decal images, including flames, racing numbers, license plates, sponsor logos, car panels, brush strokes, vintage military emblems, foreign military emblems and more! Give your model cars the perfect touch... personalized license plates! The software includes license plate templates for over a dozen popular states. How cool is that? Is your decal image too big (or too small)? No problem! Just scale it to any size you need.